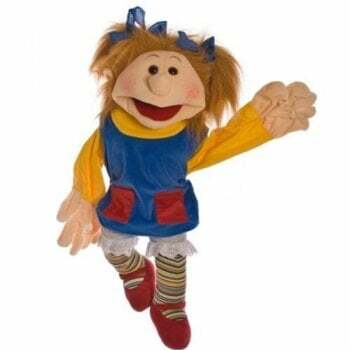 Large Lotta Living Puppet* - Lotta comes with a super blue dress and orange top. Light skin tone. Good mouth movement. Access into hands for picking things up, clapping and signing. Great teaching aid. Removable Bloomers & Ribbon. Not Suitable for Children under 10 Months due to long hair. Please keep product information. Dimensions: Height: 65 cm.